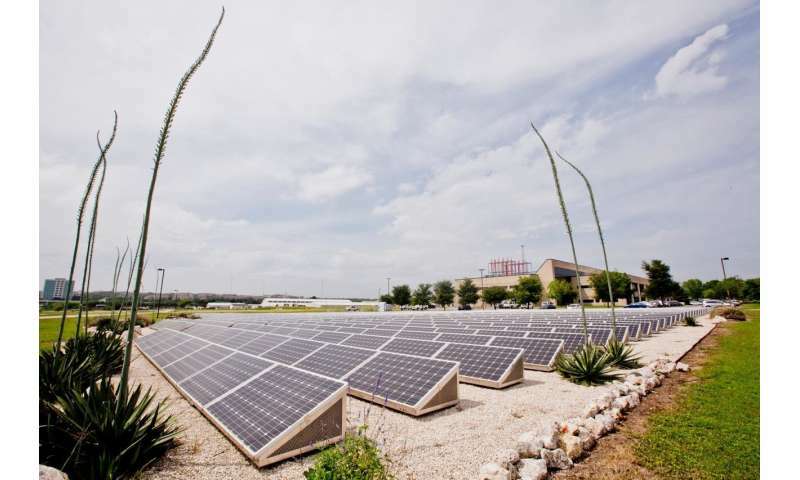 That's why the Department of Energy has awarded $3 million to engineering researchers at The University of Texas at Austin to overcome the Achilles' heel of the solar power story since Day One: how to store its energy. But experts from UT's Cockrell School of Engineering have developed a way to integrate solar power generation and storage into one single system, effectively reducing the cost by 50 percent. The UT project will develop the next generation of utility-scale photovoltaic inverters, also referred to as modular, multifunction, multiport and medium-voltage utility-scale silicon carbide solar inverters. "Our solution to solar energy storage not only reduces capital costs, but it also reduces the operation cost through its multifunctional capabilities," Huang said. "These functionalities will ensure the power grids of tomorrow can host a higher percentage of solar energy. By greatly reducing the impact of the intermittence of solar energy on the grid and providing grid-governing support, the M4 Inverter provides the same resilience as any fossil-fuel-powered grid." The DOE awarded $20 million in funding for nine projects to advance early-stage solar power electronics technologies. The projects chosen were deemed critical to addressing solar photovoltaic reliability challenges, lowering the cost of installing and maintaining a photovoltaic solar energy system and achieving the DOE's goal to cut in half the cost of electricity for a solar system by 2030.